Air India Air Transport Services Limited, Is Recruiting Eligible Indians To Above Mentioned Posts In Contractual Basis For 3 Years, Duty At Cochin International Airport Limited. So Interested People Are Required To Attain The Walk-in Interview In Date Mention Below. Jr. Executive (Technical) →04 Vacancies. Total Number Of Vacancies →154 AIATSL Walk In VacancieVacancies 2019, Check Out The Image Below To Know More About It. B. Eligible Criteria For This Job Of Air India Air Transport Services Limited 2019. 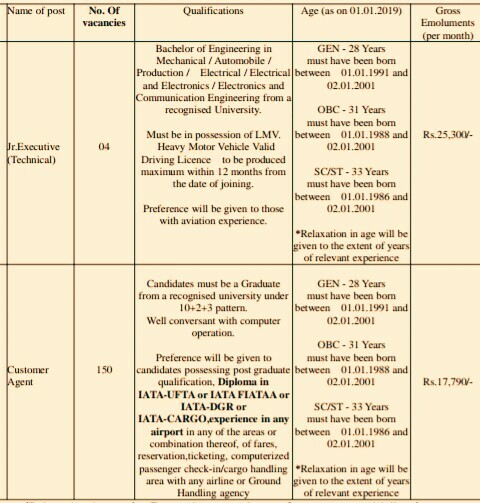 Educational Qualifications →Check The Image. Mode Of Examination/Selection Process →Selection Will Be Done On The Basis Of Performance In The Personal Interview/Group Discussion ,Personal Interview, Pre-employment Medical Examination. Process To Apply →Applicants meeting with the eligibility criteria mentioned in this advertisement, as on 1st January 2019 are required to WALK-IN in person, to the venue, on the date and time as specified above along with the Application Form duly filled-in & copies of the testimonials/certificates (as per attached application format with this advertisement) and non-refundable Application Fee of `500/- (Rupees Five Hundred Only) by means of a Demand Draft in favour of “AIR INDIA AIR TRANSPORT SERVICES LTD.”, payable at Mumbai. No fees is to be paid by Ex-servicemen / candidates belonging to SC/ST communities. Please write your Full Name, & Mobile.No. at the reverse side of the Demand Draft....(From The Official Notification). Date Of Walk-in Interview →17th Of February, 2019, For The Junior Executive Post Only & 18th Of February, 2019, Customer Agents. For More Info →Visit The Official Website Here>The Official Website Of AIATSL. Now Apply For This Job Of AIATSL. Click Here To Download Both Official Offline Application Form & Notification.